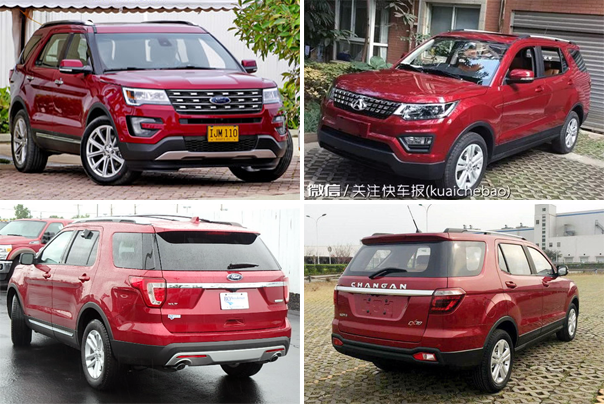 The Chinese Range Rover Evoque clone Landwind X7 has revived an old habit among Chinese automakers, of whom we had thought they’d have grown up by now and had quit copying foreign car designs. However, last month two of the three all-new models launched in China are blatant copy-paste jobs again. You’d think that especially Changan, the largest of China’s domestic auto brands with almost a million domestic sales last year, would be large enough to have their own design department. But no, they just decided to screw over their own Joint Venture partner Ford by “taking inspiration” from the Ford Explorer for their new Changan CX70 SUV. Especially from the rear ¾ the door profiles, C-pillar and rear side window, the chrome bar between the rear lights look an awful lot like the Explorer. At the front the headlights are a bit more stretched and the grille is a bit thinner, but the placement of the hood is similar and the bottom end of the bumper also. The entire car is a bit narrower, giving it different dimensions, but the resemblance is still remarkable. Maybe it’s a stab at Ford for planning to have the Explorer for the local Chinese market produced by its Jiangling-Ford joint venture which produces its commercial vans and the Everest SUV. Not sure what Ford thinks of this design from the company that produces all other Ford passenger cars including the Edge SUV for the local market, but I don’t think they’re going to make a big deal of it unless Changan starts to export it to the US, which is highly unlikely. And 72 sales in its first month on the market don’t make it an instant blockbuster that could threaten the Explorer either. The second and even more obvious copycat arriving in Chinese showrooms in February is from famous patent-buster Zotye, who have launched the SR7 this month. The SR7 bears more than a slight resemblance to the Audi Q3 with the exception of the grille, which appears stolen from a Volkswagen, and the rear lights, which are more Audi Q5-like. But just look at the shape of the headlights, the seam between the hood and the front fender, the crease in the hood, the roof rails, and then in the side view the character line that runs from the headlights to the rear lights, the bottom door profiles and wheel arches, the door handles, the shape of the C-pillar and the lights in the rear bumper. I recognize a lot of Audi Q3 in this design. Too much? 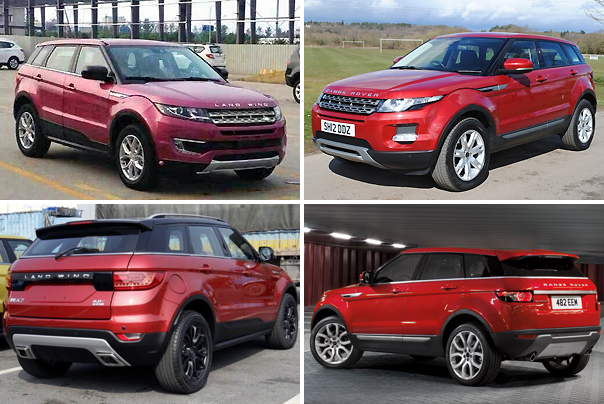 That depends on how Audi has gotten its patents filed in China, as Land Rover hasn’t even bothered to try to sue Landwind for its X7, despite the obviousness of the similarity, even as far as the logo in the grille and the brand name in 3D letters on the front of the hood. Zotye is not done yet with their copying, in the second half of this year they’ll launch the SR8, which is an almost 1:1 copy of the Porsche Macan. The grille and side vents in the front bumper are the most obvious resemblance, as the headlights are a bit more sharply drawn. However, again the creases in the hood, the wheel arches, roof rails and the C-pillar are almost exactly the same as those of the Macan, but also the door mirrors, the front fog lights and the exhaust pipes. The rear lights and the hatch are a bit different and are more Audi A6-like. And the rear license plate is positioned in the hatch instead of in the rear bumper like on the Macan. At least it’s painfully obvious which brands inspire the Zotye “designers” the most. In the not too distant past, copying foreign designs was even more popular among Chinese automakers, most notably Shuanghuan who made the Sceo, an SUV with the front of a Toyota Land Cruiser Prado and the rear of a BMW X5 and also the Noble, a Smart Fortwo clone (which I spotted in Agadir, Morocco last year). BMW successfully sued Shuanghuan to prevent them from selling the Sceo in Europe, but couldn’t stop sales in China. Another famous copying brand is Yema, with its Audi A4 Avant lookalike F16, the Subaru Forester clone F99 and lastly the F12 with the rear of yet again the Forester, but the front of the Kia Sportage. And don’t forget Yema still builds all of its models on the 1980’s Austin Montego/Maesto platform! There are dozens of other examples on China’s roads, and you’d think that now that most of them have reached a scale large enough, they’d quit copying and stand on their own feet, but the temptation to take shortcuts is strong and patent laws in China are murky and hard to enforce by foreign companies trying to fight the local underdog on its home turf. Let’s just hope the three models featured in this article are the last spasms of this phenomenon before Chinese developers realize that an original design is best for the brand in the long term. Some Chinese car brands have already launched good looking cars with original designs, hopefully paving the way for the others. 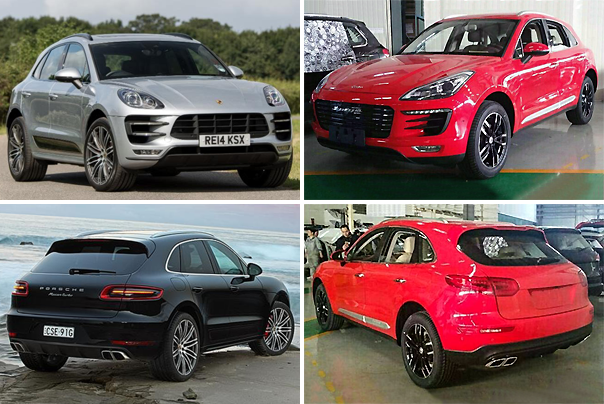 Perhaps they justify it on the grounds that it’s not copying, but paying homage to great design 🙂 The Porsche Macan ‘copy’ is particularly effective. Agree on Zotye/Yema and ChangAn has been somewhat lazy, but it’s not exactly as blatant a copy as Zotye’s of VAG group SUVs (personally I ask why don’t they copy better looking ones; the Q3 and Macan aren’t exactly the best looking designs out there and if you’re just going to copy a design – go for a decent one). 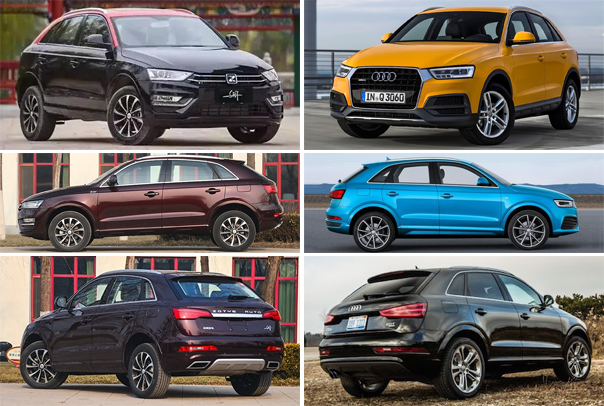 For the most part though, it seems that design has finally arrived in China, GAC, Haval, Borgward, BYD, Changfeng, Geely, Qoros and MG have all produced decent looking cars over the past few years – I’d even consider owning a GAC Trumpchi GA8 – it’s a good looking car (I can also say that for Qoros, a Haval H6 Coupe, a ChangAn CS35 or CS75 or a Dongfeng A90). A production version of the ChangAn Raeton concept from a few years back would be great too.